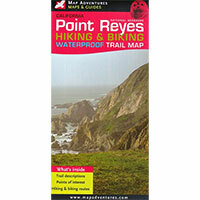 Find your way around Point Reyes National Seashore and vicinity with this four-color topographic map showing every major road, trailhead, and trail in the park. Notes campgrounds, picnic and parking areas, restrooms, telephones, and visitor centers. Shows notable local businesses, including oyster farms and kayak rental agencies. Also covers Samuel P. Taylor State Park, Audubon Canyon Ranch, Tomales Bay State Park, Bolinas Lagoon Open Space Preserve, and parts of the Golden Gate National Recreation Area, plus an inset of the Bear Valley Visitor Center area. Printed on tear-resistant paper.